This image is from the British Arctic Expedition (1875-76) and it depicts an aurora witnessed by members of the expedition. Between 1818 and 1918, over 200 expeditions were sent to the Arctic. Why the intense interest in Arctic Science? Arctic science served as a means of asserting sovereignty in a region where the continental shelves of five countries – Russian Federation, U.S.A., Canada, Norway, and Denmark – all dip into the Arctic Ocean. Arctic science opened a gateway to understanding one of the most isolated and remote places on earth. Practical knowledge gained from arctic science could have a direct effect on global economics and commerce. People believed that a more complete understanding of arctic meteorology would lead to better weather forecasting and improved shipboard navigation. Better weather forecasting would reduce the loss of ships wrecked in ice and storms. In 1876, a whaling fleet of a dozen vessels had been wrecked in the Arctic, with property damage estimated to be in the $500,000 range. Expanding geographic knowledge of the Arctic, such as seeking a northwest passage through the Arctic Archipelago, would also increase European access to markets in the East. Who worked on the science of these expeditions? Mainly, military officers and enlisted men. British Naval Officers deferred to The Admiralty Manual, which provided detailed instructions for collecting natural history specimens and for observing geophysical, astronomical, and meteorological phenomena. While success in arctic science was heavily influenced by the temperaments and personalities of those involved, many rose to the occasion. British Naval Officers spent hours being trained on how to use scientific instruments like magnetometers and pendulums, and learned how to prepare natural history specimens for collections that were eagerly awaited by naturalists back home. They educated themselves in botany, astronomy, geology, ornithology, and a range of other natural and physical sciences. They even worked closely with the manufacturers of scientific instruments, to ensure they were built to withstand the rigours of an arctic climate. Many were rewarded for their efforts by being elected to the Royal Society of London upon their return from the Arctic. A range of scientific disciplines was represented on arctic expeditions of the 19th and early 20th centuries. However, interest in developing better systems of navigation meant that there was a definite hierarchy to arctic science. In the case of the British Navy, the relative importance of each discipline was spelled out in The Admiralty Manual. Scientific Instruments of the First International Polar Year (1882-83). 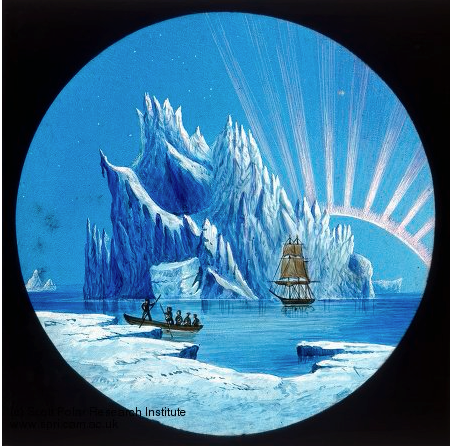 By far the most important science to arctic explorers of the Victorian Era was astronomy because it provided data necessary for advancements in navigation. By the mid 19th century, chronometers were fairly dependable and were used to establish the latitude of a ship. The difference in time between the chronometer and the local time, as observed by the sun or other celestial bodies, corresponded to the difference in latitude between the place where the chronometers had been set, and the place where longitude was being determined. One hour’s difference meant 15 degrees difference in longitude. Establishing the position of a ship bound for the Arctic, however, was a much more difficult task, due to the fact that a ship's compass became increasingly unreliable as it approached the magnetic North Pole. The earth’s magnetic field was poorly understood during much of the 19th century. There were also lots of ideas about the causes of geomagnetism, and why it seemed to vary by latitude. These included heat, electricity, chemical action, and contact between dissimilar metals below the earth’s surface. Confusion also surrounded the location of the magnetic north and south poles, as well as whether each hemisphere had a single pole or multiples poles. Terrestrial magnetism: Measurements of declination, inclination or dip, and intensity determine the earth’s magnetic force. These measurements were carried out using delicate instruments called magnetometers and declinometers. Small magnetic bars were suspended on filaments within scientific instruments and used to measure magnetic intensity at a specific location. In other instruments, small needles were magnetized to measure the declination or angle of the earth’s magnetic field at particular latitude. All of this was done within observatories that were often constructed from ice and snow; materials that offered several unique advantages. First, iron fasteners (nails and screws) the presence of which negatively affected measurements of the earth’s magnetic field, were not required when constructing snow and ice observatories. Second, under the right conditions, the inside temperature of a snow house could be as much as 40° F warmer than outside, meaning that an observer, well muffled in furs, could remain for four or five hours at a time watching the swinging magnetic needle. Observations of the auroras or northern lights were also of extreme interest to 19th century scientists as they often coincided with magnetic disturbances. In November 1882, members of the Lady Franklin Bay Expedition observed a spectacular aurora display, the likes of which were believed to be rare at such high latitudes. This particular display was monitored every five minutes over the twenty-nine hours that it lasted. Force of gravity: the science of geodesy was also at its infancy in the Victorian Era. There was a recognition that the force of gravity varied by latitude, thereby indicating that the earth was not perfectly spherical. The precise shape of the earth was not known, but it could be approximated if the force of gravity were measured at observatories established at different latitudes. Pendulums were swung within these observatories, and their periods of oscillation used to determine the force of gravity at that location. Like measuring magnetism, pendulum observations were frequently done under extreme conditions. The often-intense cold made it difficult to turn the tiny setscrews used to adjust these sensitive instruments. It also made the long periods of time necessary for making observations almost unbearable. Hydrography came right after geomagnetism, in terms of its importance in arctic science of the Victorian Era. Hydrography is the art and science of map-making for navigation. It involved observations of tides, winds and currents, the location of distinctive land forms, the identification of major beds of vegetation, the number and direction of the flights of flocking birds, ocean temperatures, tidal observations and so on. Hydrography overlapped with geography in the 19th century, owing to the fact that the latter had yet to be formally recognized as a distinctive academic discipline. Consequently, geography was also tied in with geology and meteorology. Barometers, anemometers (for measuring wind speed), and thermometers were used to record observations at scheduled times. 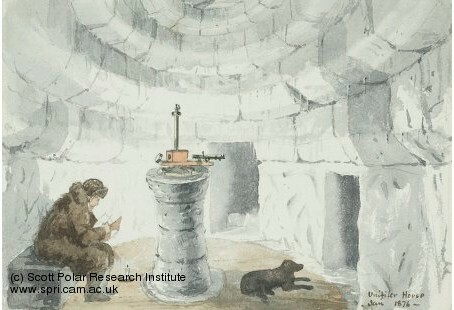 The image above is an illustration by E.L Moss, who was part of the British Arctic Expedition. On the back of the illustration is written the following: “The unifiler is a suspended magnet for examining horizontal magnetic force. The snow hut in which it is suspended is the third or fourth we built. It is 11/6 diameter 10/6 high. It is approached by a snow passage like a tunnel 120 ft long. The instrument stands on its snow pedestal. The opening in centre of the sketch is the entrance passage that to the right leads into the Dip Circle House. Nellie is looking down the passage watching the light at the far end where her master is observing the Dip Circle... The floor is almost on the ground and is covered with matting. The dome and walls are covered with long feathery pendants of ice crystals”. The 19th century was a heyday for natural history, thanks in part to the publishing of Charles Darwin’s On the Origin of Species in November of 1859. Even before this monumental event, every class of British society had been encouraged to participate in natural history. Unfortunately, civilian scientists were often excluded from British polar expeditions. As a result, they were forced to rely on officers and crew for collecting and preparing specimens, sketching and observing plants and animals, and so on. Luckily, one of the advantages of natural history was that it required few special skills. This was not the case for geomagnetic and navigational research, which demanded strong mathematical abilities. Natural history had no immediate utility for the Navy, but it did occupy the time of its officers and sailors during periods on the expedition when there was little to do. Geology was prominent because of its economic benefits. Arctic geology focused on such things as isostatic rebounding of coastlines and on the behaviour of ice and its role in shaping coastlines. Identifying minerals was also deemed important, and mariners were trained to identify those deemed most valuable. Zoology was of interest to ship's surgeons, who were generally fascinated with understanding life in all of its forms. The focus of natural history research on arctic expeditions was firmly on taxonomy, identifying species unique to specific geographical provinces. As a result, theory often took a back seat to field naturalist pursuits, such as collecting and describing specimens. Biogeography was an area of great interest. Studying animals like caribou provided excellent examples of the effects of physical barriers like mountain ranges on the geographic distributions of animals. Climate, soil and permafrost were also important to naturalists. Establishing the northern limit of the treelines, as well as the limits of discontinuous permafrost, for example, provided important information on the growth cycles of plants. The effects of extended periods of daylight and darkness on plant growth and reproduction were also of great interest. Carnivores and herbivores were studied, but botany and ornithology shared a certain popularity among arctic naturalists on these expeditions. Plants needed to be well-dried and described, and The Admiralty Manual provided specific sets of instructions on how to do so. No specific reference was made in The Admiralty Manual to methods unique to observing and recording Indigenous peoples in the Arctic, such as the Inuit. This may have had something to do with the fact that anthropology and ethnology were disciplines still in their infancy during the 19th century. This lack of specificity meant that everything was grist for the mill in ethnographic research, and a wide range of information on Inuit culture was collected. Coloured portraits of Indigenous persons encountered during voyages to the Arctic were encouraged, as were measurements of their physical characteristics. Unfortunately, few attempts were made to document aspects of human societies that might be unique to northern peoples. Rather, explorers were instructed to gather information on language, literature, and poetry. 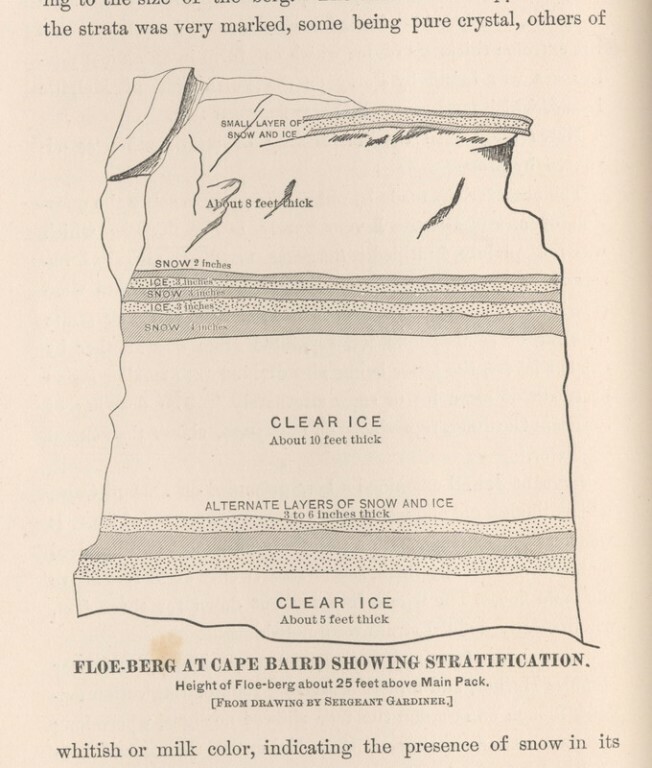 Floe-berg at Cape Baird showing stratification of ice. The height of the Floe-berg is about 25 feet above main ice pack. [From a drawing by Sergeant Gardiner.] Grinnell Land, August 1882. Orders: to establish winter quarters, conduct scientific observations, and carry out sledging excursions to the highest northern latitude possible. At Discovery Harbour and Floeberg Beach, Ellesmere Island, much of the scientific work was carried out in the fall and winter of 1875-76 in snow or tent structures near the ships. 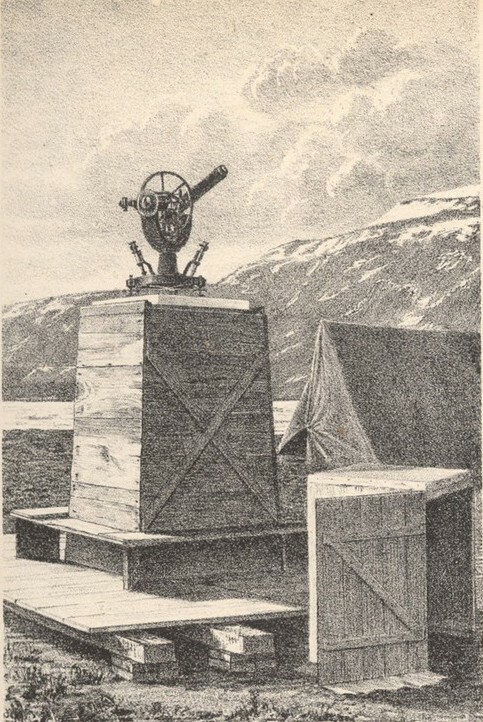 Observatories were erected at Floeberg Beach, at 82 degrees, 27 minutes north latitude. 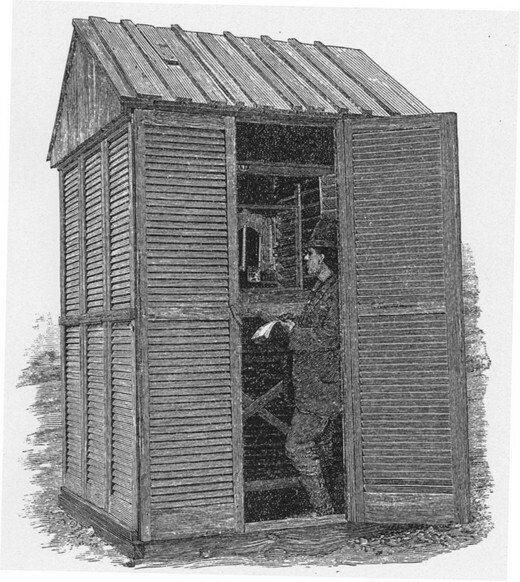 Eventually there were three ice house observatories for the magnetic work – one for measuring horizontal magnetic intensity; another for measuring dip and total force of the magnetic field; and a third for measuring declination in the magnetic field. Sadly, incidents occurred which rendered much of these measurements of little use. It was discovered that iron bolts had been used in the pedestal of one instrument, thereby upsetting its magnetic measurements. The instruments were also easily damaged, requiring field repairs that rendered measurements incompatible with those recorded prior to it being broken. Other scientific activities included astronomical, botanical, zoological, and geological observations, as well as oceanographic measurements of tides, and spectroscopic observations of solar and auroral phenomena. The Admiralty agreed to fund a scientific manual compiling syntheses of the scientific data acquired by the expedition. Alongside its geographical discoveries, the creation of the Admiralty Manual stands as the major legacy of the expedition. Accumulate arctic weather data, which was increasingly viewed as important to accurate global forecasting. Orders: conduct astronomical and polar magnetic observations; collect meteorological, oceanographic, zoological, botanical, and ethnographic data, attempt to beat the British Arctic Expedition’s Farthest North record. Sgt. Winfield Jewell taking meteorological observations at Fort Conger, Grinnell Land, August 1882. Only five years after the return of the Nares expedition, the Signal Corps of the United States Army staged its own expedition to the High Arctic as part of the First International Polar Year. They set up a large station house to serve as wintering quarters on the shores of Lady Franklin Bay. This was the same site where HMS Discovery, one of the British Arctic Expedition ships, had wintered in 1875-76. At Fort Conger, expedition astronomer Edward Israel’s magnetic data were considered the most thorough of the myriad scientific observations taken by the party between August 1881 and August 1883. As with the Nares expedition, magnetic observations assumed a particular importance for the Greely party. Despite the unsettling failure of their supply vessel to arrive in 1882, the Greely party maintained their magnetic observations throughout their increasingly troubled time at Fort Conger. Other research activities included the collection of archaeological artefacts, and animal and bird specimens intended for transport back to the United States. When a resupply vessel failed to arrive for the second consecutive year in 1883, the expedition party made a hasty retreat from Fort Conger. As a result, many of the intended specimens and artefacts were abandoned at Fort Conger in August 1883. The expedition’s most valuable work was its astronomical and geophysical observations. The geophysical work included regular recording of tidal data and pendulum observations, key to measuring local gravity, which varies at different points of the earth. Scientific work continued to be done at Fort Conger during the 20th century, albeit sporadically. During the 1950s, the Defence Research Board conducted geomagnetic observations at Fort Conger, as did Energy, Mines & Resources Canada (now called NRCan). Today, an automated weather station sits like a sentinel at Fort Conger, silently logging the meteorological data that in the past so many men had laboured.